Combine all ingredients in a bowl with the steak and mix well. Place in the refrigerator and allow to marinate for 20 minutes. Cook the marinated steak in the oven, on the stove or on the grill according to package instructions. In a large salad bowl, place one cup of your favorite cooked grain. Top with your favorite salad greens and fresh toppings – there is no wrong answer here! 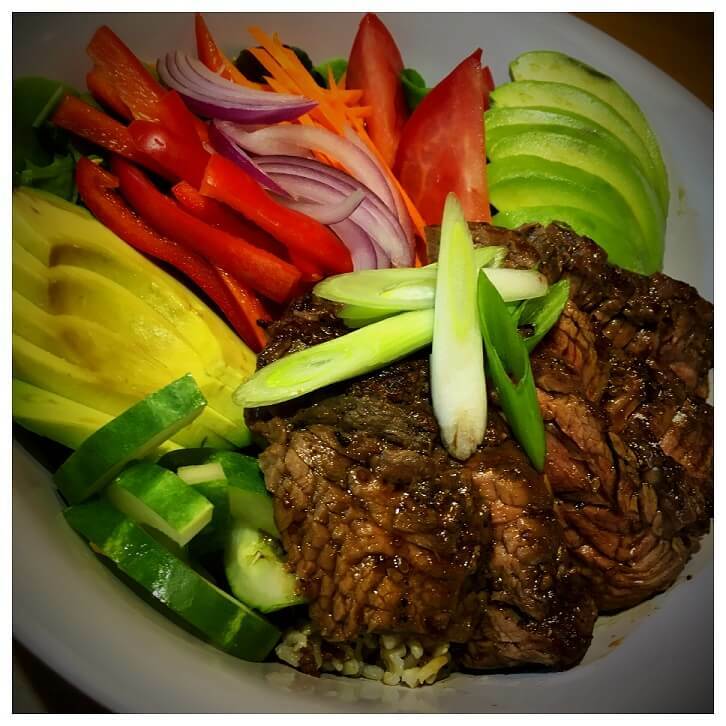 Slice your marinated, cooked No Name Brand Original Steak and place it on top of the bowl. Drizzle your favorite bottled Asian Salad Dressing over the bowl and enjoy! 1 cup your favorite cooked grain – brown rice, quinoa, farro, wild rice, white rice, etc. anything else you desire – it’s your bowl!